New research finds that only a small percentage of Americans, less than 9 percent, shared links to so-called “fake news” sites on Facebook during the 2016 presidential election campaign. This behavior, however, was disproportionately common among people over the age of 65, researchers report. “Despite widespread interest in the fake news phenomenon, we know very little about who actually shares fake news,” says Joshua Tucker, a professor of politics at New York University and co-director of the Social Media and Political Participation (SMaPP) Lab. “This study takes a first step towards answering this question. “Perhaps most significantly, we find that sharing this type of content on Facebook was a relatively rare activity during the 2016 presidential campaign,” Tucker says. Among the overall sample of study participants, which researchers drew from a panel survey the polling firm YouGov conducted, only 8.5 percent shared links from fake news sites via Facebook. Notably, only 3 percent of those aged 18-29 shared links from fake news sites, compared with 11 percent of those over age 65. Critically, the association with age appears to be independent of respondents’ ideological or partisan affiliations. “If seniors are more likely to share fake news than younger people, then there are important implications for how we might design interventions to reduce the spread of fake news,” adds Andrew Guess, an assistant professor of politics and public affairs at Princeton University. The panel survey, which researchers conducted in three waves from April to November 2016, included a sample of approximately 1,300 respondents who agreed to allow an app to temporarily share with the researchers information about their own timeline posts, including external links. The researchers did not have access to the content of people’s news feeds or information about their friends. Respondents read a privacy statement that informed them that they could withdraw at any time and that the researchers would not share any personally identifying information. To identify fake news sources, the researchers relied on a list of domains assembled by Craig Silverman of BuzzFeed News, the primary journalist covering the phenomenon in 2016. They classified as fake news any stories coming from such sites. The researchers supplemented this list with other peer-reviewed sources to generate a list of fake news stories fact-checking organizations had specifically debunked. 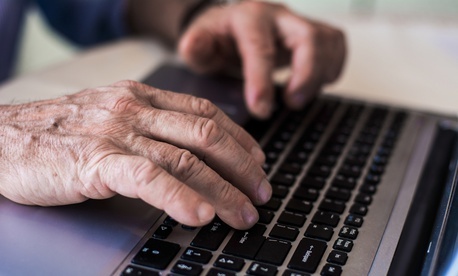 In explaining their findings, the researchers outline how the correlation with age could reflect differences in more fundamental traits or skills—such as digital media literacy—that are theoretically related to social media sharing behavior. Exploring these possibilities, they note, should be a focus of future research. By contrast, education, income, and gender were not systematically related to being more likely to share fake news, the study finds. The researchers did find a strong partisan difference: 18 percent of Republicans shared links to fake news sites, compared to less than 4 percent of Democrats. However, they caution against associating ideology with an underlying proclivity to share fake news, noting that this finding might simply be a result of the fact that most fake news produced during the campaign was pro-Trump or anti-Clinton in orientation. Next Post | Agencies Spent $4 Trillion Last Year; Did Taxpayers Get What They Paid For?